An important element in TechYukon’s effort to grow the territory’s technology business sector is engagement with Yukon youth. We look to recruit their interest in our industry, and to help them develop the skills they will need to become founders of or employees in local technology companies. In furtherance of this aim, over the week of July 10 through 14, TechYukon conducted a crash course on software engineering techniques for six Yukon youth with either a background or an interest in programming and web development. The participants (four males, and two females) represented a wide range of experience in these areas. Some were either graduates from or final-year students at universities or technical institutes, already quite specialized in their training. Others were undergraduates in other science disciplines, with an interest in developing a better grounding in programming. Still others were young people locally trained or self-taught, looking to enhance their skill sets for future employment opportunities. 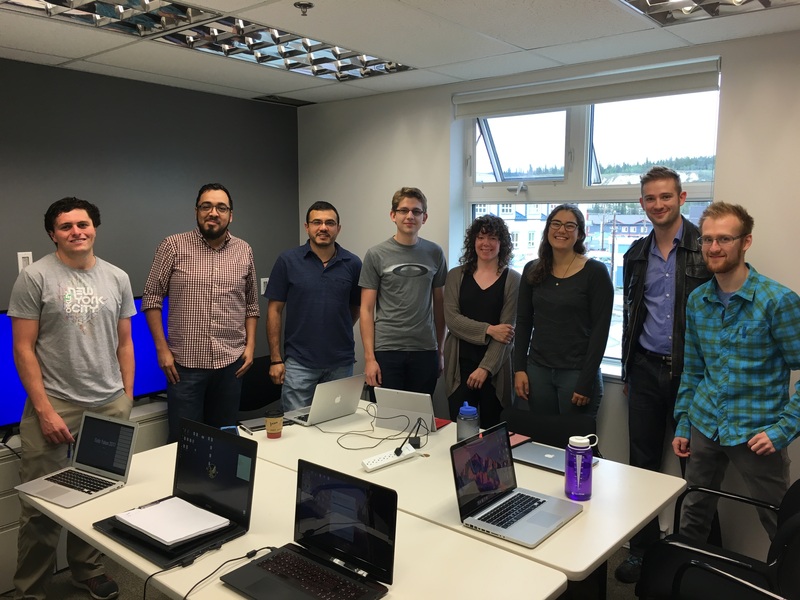 The content preparation and presentation for the course was carried out by two local companies—Marcos Castillo of Bizont, and Camilo Rivera of Apprendo, both TechYukon members, and both with extensive backgrounds in the Drupal web server environment, and web development tools and procedures. A typical day ran from 9:00am to about 4:30pm. The first day was given over to introduction to general web development principals and tools, databases and other fundamentals. Day two concentrated on an introduction to the Drupal environment and website development, with the students divided into two teams of three each to develop a mock-up online campground registration system. On the third day, there was training in the development of custom modules within Drupal, and general emphasis on programming. On the fourth, the students—again, working in two teams of three—used the skills acquired from the days before to develop a custom form for a library book checkout system. On the final day, they worked individually to develop a custom form connecting to a Government of Canada open data service. Also on the fifth day, Mark Burns and Geoff Harries of the Yukon Government’s ICT branch gave a presentation to the students on their department’s current efforts and future plans for e-Government service delivery. They talked about their decision to use Drupal as their foundation technology, and their commitment to using local private sector resources as much as possible in rolling out further services. This was helpful in giving the students an idea of where they might find practical and profitable employment for the kinds of skills presented in the Boot Strap course. At the end, the students stayed on well after 5:00pm on the Friday, finishing off the final touches on their projects and talking about the results from the week. Marcos Castillo, who did most of the mentoring in the final few days, was very impressed with the students, who were cooperative and willing to learn. Student observations were that they saw value in the knowledge they had gained, and had a better understanding of the Drupal platform as something more than just another Content Management System. Funding for this event was provided by the Yukon Government’s Department of Economic Development. Thanks go out to them for their support, and to MakeIT Solutions, for the free use of their meeting rooms for the venu. And also to the companies who allowed these students to take time off from their summer jobs to take part in this learning experience. In future, TechYukon intends to make this boot strap event a component in a larger student job placement and mentoring program, designed to give students gainful summer employment and real-world work experience with local companies active in sector areas of interest to them. Planning and funding proposal activities towards that project are in the works right now.